First Row: Remington, Edward Stonebock, Tom Galvin, Doubet, Howard Ferdinand, Nyberg, Tincher. We all know something about St. Paul. Should we not like to know more about it? We live here. We help to make the city what it is, and it helps to make us what we are. It is very interesting to us. There is a Greek word, pronounced ko-me, which means an abode. The Greeks applied the word to a village. It has the same real meaning as our word home, which we apply to the place where we and our parents live. You sec how closely akin these two words are. The village, or the city, where we reside is also our home, or our home city. Our homes arc always dear to us, and our city ought to be also. Men travel far and grow old, and yet there is always in them an irresistible longing to visit the land of their birth or the place where they were born. Came peeping in at morn,"
he meant that he remembered it with great pleasure. Now that same feeling which we have about our own homes we can have in some measure about our home city and our country. There is a kind of civic pride and patriotism that we have about the home city not only because it is worthy in every way but because it is our city. All boys and girls ought to realize that much of the city belongs to them in much the same way that their home is theirs. They are joint owners of its streets, its public buildings, its schools and charitable institutions, its parks and playgrounds, and all its beauties and advantages. We like to trace our family histories and to meet the relatives we have not seen. In the same way it will be interesting to learn more of the history and environment of our home city. It is beautifully situated, but how did nature make the river and the hills and the bed rock foundations? Here are the Indian Mounds, but who made them, and when, and why? There are many points of resemblance in all larger cities, and yet each one has its own special history, landmarks, and distinct characteristics that make it different from others. Here is a large prosperous city. What kind of beginning did it have? Who first explored this region? Who founded the city and gave it its name? Were there Indians here? Who were some of the early explorers and what did they contribute to the establishment and advancement of the city? How did these men live in those primitive days without all the modern conveniences that we enjoy? These are just a few of the first questions that we might ask. There are many more. Events outside of the city contributed much to its history. You have seen Fort Snelling with its grim old towers and the quaint little town of Mendota on the opposite bank of the Minnesota River. Here were some of the first activities that finally centered at St. Paul. We shall learn about them. Coming to our own time, there are many phases of interest. Would you not like to know how much business is done in St. Paul? Cities are often judged by the business they do and by their bank clearings. How many tons of freight go out in a year? How many come in? How many go through? Why is St. Paul called the Gateway to the Northwest? Then come other questions. A city is like a great machine. It does not "run" itself. Who "runs" it? How are its officials chosen? What power do we give them? Why must we have laws? Why must we obey them? What else do our representatives do besides make laws? What duties are left to us to perform? You will see that it is necessary for us to have certain information about our city. Shall we not be better citizens the more we know about our city and the more interest we take in its welfare? 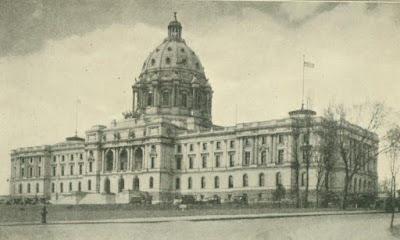 The St. Paul auditorium was built through the contributions of many public-spirited citizens. Very many of the contributions were very small, but a multitude of them made the building possible. We can contribute many other things for the good of the city besides our gifts or taxes. We can help to keep it clean. We can stand for health and safety, good morals, honesty, and obedience to law. A good city must consist of more than buildings and business. It needs good citizens. It is the aim of this book, therefore, to introduce the city and the citizens, especially the younger ones, to each other and to foster an acquaintance and friendship that will be lasting, mutually beneficial, and extremely pleasant. The book will bring before you a great moving picture of the development and civilization that has come to our home city. But do not only read about it. See it, study it, plan to do something for it. Then you will be more loyal to it, have more pride in it, and ever do more and more to make it the busiest, the most beautiful, and the best city you know. Then, as you look out over the landscape at the river, the bluffs and terraces, the hills and the valleys, they will mean more to you as you know their history. They will be a magnificent picture poem by Nature itself, that, after all, is the greatest artist. And as you understand the extent of every tiling that constitutes a city, you will marvel at the countless tasks that must be done, the meaning of all the busy throng you see in factory or store or office or as it turns to amusement and recreation, and think for yourself what part it may be your privilege and duty to perform in all these activities. Who owns the city of St. Paul? Do you have more interest in what you own? Why do men love the place were they were born? What does the city do for boys and girls? What can they do for the city? Why is it worth while to know all you can about St. Paul?